Myra Peterson and sister Diane will miss their granny, who made the best chocolate chip cookies they ever had. 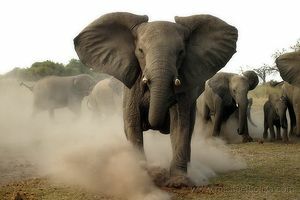 HARLEM, New York -- A deranged man beat an elephant to death, using his grandmother as a bludgeon. Scott Peterson, 24, flew into a rage after seeing the creature in the kitchen of his grandmother's apartment. He then grabbed 76-year-old Matilda Cuttlefish and used her as a club until both the elephant and grandmother were dead. In the apartment below, Sam Malone heard the commotion and dialed 911. "There were thumps and high-pitched screaming and trumpeting, and after about half-an-hour of having to listen to that I decided to call the police." Charging: But Peterson is the one who is going to be charged. As officers went into the apartment and tried to arrest Peterson, he refused to give up. He knocked down officer Baldy Eastwood with a dismembered tusk before being subdued with peanuts and taken away. "It was horrific," said Eastwood, "We got there too late. By the time we got the door open, he was swinging his poor grandmother around like a catherine wheel. The sound it made. Jesus. I'll never forget it, as long as I live. It was like a coconut being smashed on the sidewalk, followed by - excuse my French - a flatulent sound." Information about Peterson's background is slowly becoming available. He was no stranger to elephants. He had been in prison before for three charges of zoo-related robbery, including a failed attempt to saw off the valuable ivory tusks of Sheema, New York City zoo's most famous elephant, which was foiled when a plucky rhinoceros approached Peterson from behind and hoisted him up on its horn, carrying him to the zoo authorities by the belt. Peterson's two sisters, Myra and Diane Peterson, told the press that he had "mental problems" and was overall "not a nice person". "Scott has pachydermophobia, the fear of elephants, and haphephobia, which is the fear of being touched. Don't ask me how I know," said former cellmate Bernie Madoff. It is still a mystery how the elephant got into the apartment, but the police are "looking into it", and are open to the idea that it constituted a 'revenge attack' against the grandmother, either carried out by the elephant independently or orchestrated by an animal rights group.